A feel very much like having a pointy rock in your shoe, or walking on a pebble. Imagine if you are an athlete or sportsperson – say, a Major League Baseball player. Can you still play your normal game, to slide and run without feeling restricted, under such circumstances of having verruca or plantar wart on feet? It was a discomfort that made MLB shortstop Elvis Andrus went for surgery and missed few days of workouts. 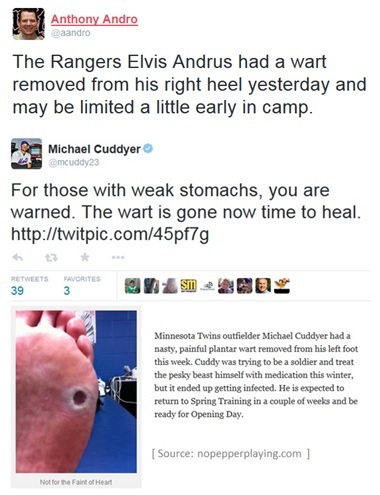 A pain that similarly made MLB outfielder Michael Cuddyer miss 7-14 days after… errr, his self-treatment to remove verruca – also known as plantar wart. Verrucas are rough, spongy growths of skin on the soles of your feet, sometimes on the heel and toes. Verruca is caused by Human Papillomavirus that enters the body through a break in the skin. As the virus enters the upper layers of the epidermis, the foot wart may begin as small shiny raised bumps, with the lesions develop into hard, callused skin over time. Verrucas normally have clotted blood vessels appearing as black dot in the middle, with a surrounding hard, white area. Warts are usually painless, but why do warts hurt on the feet – and not on the other body parts like hands? From the second your tootsies hit the floor in the morning until you fall into bed at night, your feet are basically on the move. With all that you do in a day – walking in the workplace, standing in queue, playing sports in the evening – pressures are exerted on your feet, and verrucas can turn all these everyday activities into painful ordeal. The reason is that, when these little buggers occur over weight bearing areas like heel or sole, the warts are pushed deep into the epidermis, grow inward from the plantar surface of your foot, and may impinge upon underlying tissues. The verruccas can correspondingly incur significant pain or tenderness when direct pressure is applied – because of the location of these plantar warts. Are Verrucas Contagious ( and how do verrucas spread ) ? Verrucas are caused by Human Papillomavirus types 1, 2, 4, 63 – and HPV viruses are contagious. Once verruca wart developed on feet, they can spread by direct contact and transmit to one’s self or others. A person with plantar warts can spread them to other areas of the foot by picking or scratching the wart, while contact with any skin or blood shed from the wart may cause warts to spread. According to University of Michigan, verrucas can also transmit by indirect contact from person to person or from a warm, moist environment to a human being. The humid conditions of places such as swimming pools area and public shower floors create the perfect breeding ground for viruses like HPV. Just as independent author Michael Graeme’s observation, his kids had verrucas all the time when regularly visit the public swimming pool, and when the visit stopped, the kids stopped getting the warts on foot. Keep your feet clean and dry. Change your socks daily and allow your shoes to dry thoroughly. Avoid walking barefoot, and wear footwear in public areas with most walking surfaces. Avoid irritating the soles of your feet, such as wearing narrow high heel shoes that are too tight. Once verrucas developed, do not pick or scratch the wart to prevent spread to other areas of the foot. Cover verrucas with bandage or athletic tape. Wear verruca sock as precaution or to prevent verruca virus spread. Wash your hands thoroughly after contacting verrucas and caring for the affected area. Do not share shoes and personal care item like towel with another person. Get verruca treatment to avoid further spread to oneself and others. The fact is, even with your best preventive effort, you could still find verrucas on feet at some point in your lives. If and when that happens, below are pictures of what does a verruca look like on your foot. Don’t feel depressed, as you are certainly not alone, and there are solutions. Just read on. Seriously, do you really want to self-remove your verruca with knife like this, or with nail clipper like this? You are risking to injure yourself, suffer from wound infection, and spread your verrucas even more with such dangerous acts. While American Podiatric Medical Association does not advise self-treatment – You certainly have a choice. Go ahead to read it, I’ll wait… *twiddles his thumbs* … finished reading? brief Description of the treatment and procedure. selected Video (as available) demonstrating real life case study for illustration – click to watch. real life examples of positive / negative Reviews and Results from patients / users based on actual experience. You can visit dermatologist or podiatric physician, while most general practitioners can provide first level wart treatment and removal. The doctor will evaluate and assess your verrucas and the state of your immune system to determine which treatment is the best for you. The verrucas treatment that the doctor choose may include non-invasive approach or invasive surgical procedure. Cantharidin – the liquid injection causes the skin under wart to blister and lift the wart from the skin of foot. Retinoid cream – applied at home, which works by disrupting the skin cell growth of the verrucas. Bichloroacetic acid (BCA) – a medication applied in the office that destroys proteins in the cells of verrucas. If a verruca patient has not improved substantially after the topical treatment, most doctors would subsequently recommend surgical treatment. This treatment destroys the verruca by freezing it with liquid nitrogen, causes a blister to be formed. When the blister peels off, all or part of the verruca peels off as well. Watch this excellent video, in which Dr Paul Thomas MD demonstrated and explained the cryotherapy treatment step-by-step from start to finish, using liquid nitrogen to treat a young girl’s plantar wart on her toe. The doctor may cut out the verruca using surgical knife (scalpel), with the procedure is usually done in a doctor’s office or an outpatient surgery center. Most people are treated using anesthesia that numbs the area around the warts to prevent pain. Watch this video by Dr. Matthew Neuhaus who surgically removed verruca from a patient’s foot. Lasers produce light energy beam which burns and destroys verrucas. Laser treatment is done in the operating room, with the warts area must be numbed with an anesthetic prior to the procedure, to prevent pain. Wart creams, especially Salicylic acid-based products, are common verruca treatment solutions that are widely available over-the-counter or via online purchase, normally without a prescription required. Research on 240 patients published by The BMJ (formerly the British Medical Journal) concluded Salicylic acid and the Cryotherapy with liquid nitrogen were equally effective for verrucas treatment. 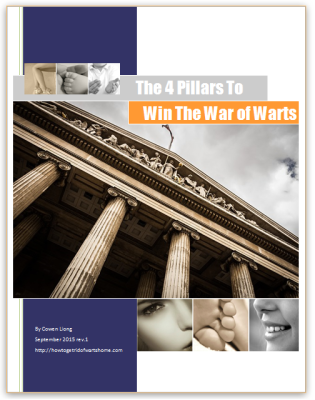 While there are many wart treatment products in the market that you could research when you have the time – below are 3 leading wart removal products for your quick reference. – Uses FDA approved ingredients. – Contains a proprietary blend of cashew plant, fig plant, greater celandine plant, etc. 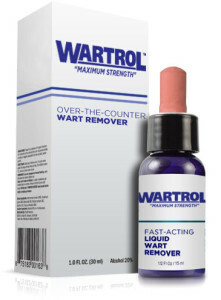 Wart removal home remedies are very popular, as people like low-cost / natural treatment options and.. to avoid the doctors! Below are some other home remedies and case studies. Watch this video explanation, or demo video below with detailed step by step illustration – first using Listerine to clean the skin to kill off the wart virus, then duct tape is used to seal the verrucas so that oxygen cannot reach it. Further read: Verruca gaffe tape vs duct tape plantar wart removal. 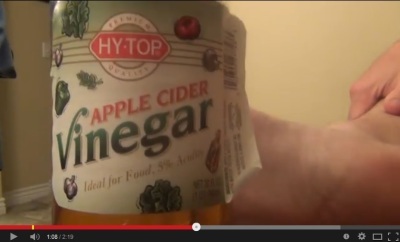 Wanna try to get rid of verrucas using apple cider vinegar? Wash your affected area, dip one cotton ball with ACV, put it on the wart, then cover it with duct tape. Watch below video demo. 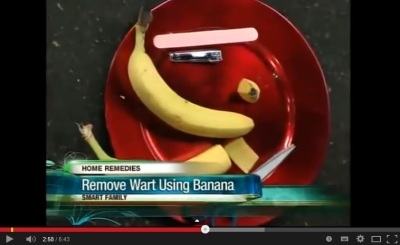 Take a banana and take off the peel and cut a piece of banana peel. Tape this peel over the wart, leave it for overnight and take it off in the morning. Watch this recommendation by natural remedy expert Dr Janet Maccaro in video below (at 2:50 mark). Naturopathic Doctor Holly Lucille explains how to remove warts with tea tree oil in this video. Simply dub a cotton ball with tea tree oil and apply directly to affected area, whereby you can check out this Tea Tree Essential Oil with amazing customer reviews. Want Additional Verruca Treatment Tips? According to University of Maryland Medical Center, nutritional support by eating antioxidant-rich fruits (such as blueberries and cherries) may enhance immune function to fight HPV and minimize recurrence warts-causing HPV. * A diet change worked for me. 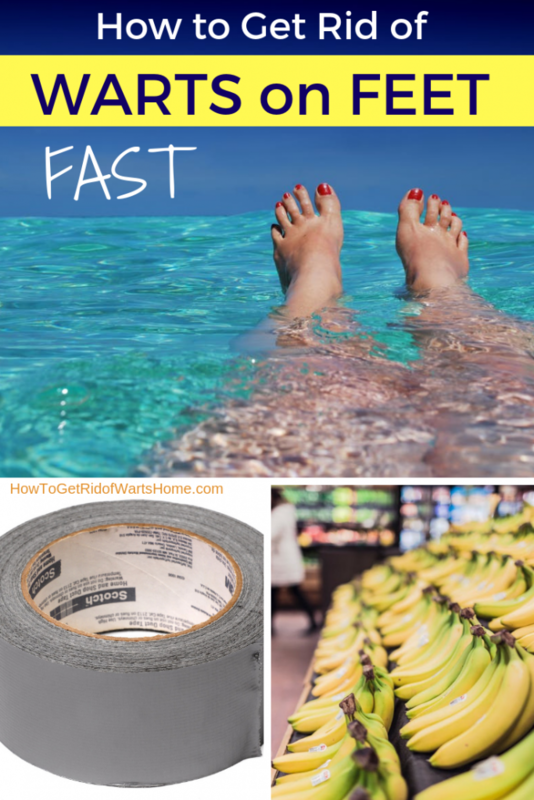 The topical medicines and duct tape made the skin swell but the plantar warts on my foot never died, two quarter-sized patches that grew and lasted over 18 months. Added fresh blueberries to my morning breakfast every day, and noticed the patches shrink after a couple of weeks. Another month of fresh berries and the warts were gone and have never come back, 5 years later. Anti-oxidant cure? / Logan @ Life Learning Today. Use special pads such as doughnut shaped pads (available at drugstores) to fit around your verruca, so that you don’t put weight on it in order to relieve the pressure on verruca that would help avoid or reduce pain. This post has covered some of the best ways to remove verrucas (plantar warts) on feet, so you just need to put them into action. If you are not sure your skin condition is a wart, or you need further advice to treat your plantar wart, then always consult a doctor or dermatologist. If you like this post, then please help to share it out and click LIKE us at Facebook, would you? Thanks! How would you remove your verrucas? Do you have any verruca treatment experience that others can learn from? 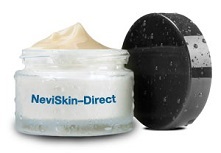 ← Nevi-Skin Mole, Skin Tags and Wart Removal Cream Reviews: Does It Work?